Fortress Of Freedom Board :: View topic - Samsung Note 3 Review! 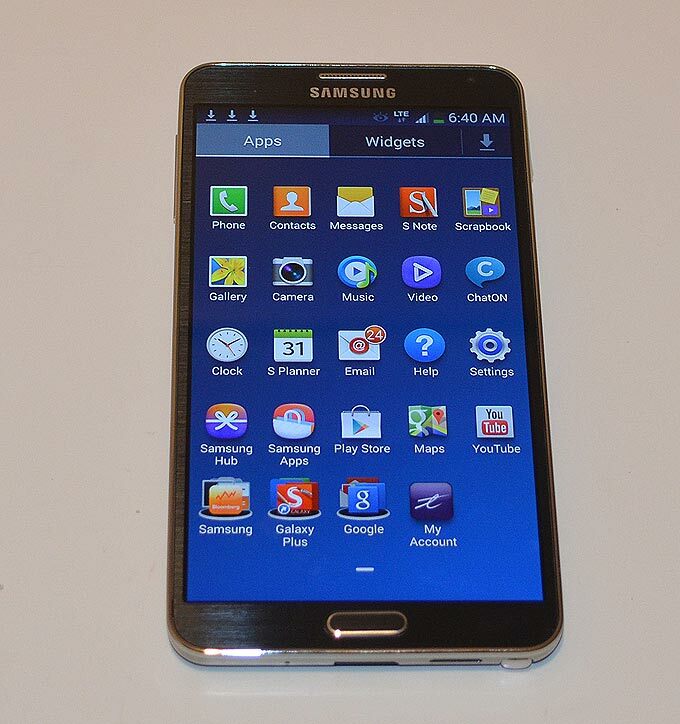 Posted: Sun Oct 06, 2013 10:49 am Post subject: Samsung Note 3 Review! This was the first cellphone I ever tried to get on opening day, and I got it. As reviews go there are hundreds on this phone out there so while I will go over the obvious, I will give you, my readers, some insight into the not so obvious. *2.3ghz Quad (4 cores) or 1.9 octa (8 cores) processor. *32/64gigs flash memory with up to 64 extra gigs in the slot ()96/128gigs total). *4K (ultra high definition - theater movie making quality) video. *5.7 inch 1920X1080 screen (true HD). Wow! for 2013 those are laptop stats and better. 4K is a first I believe. In comparison the iPhone flagship has a dual core possessor (though 64bit), 1gig of ram, 8 mega camera, HD video, 4" screen, half the battery life. Actually Apple fanboys pretend the Note 3 does not even exist - too funny in a way. The competition will be coming out with others this size but this one - now - is "the" phone to beat! Even the fake leather back shows Samsung is listening and making the devices have some panache. 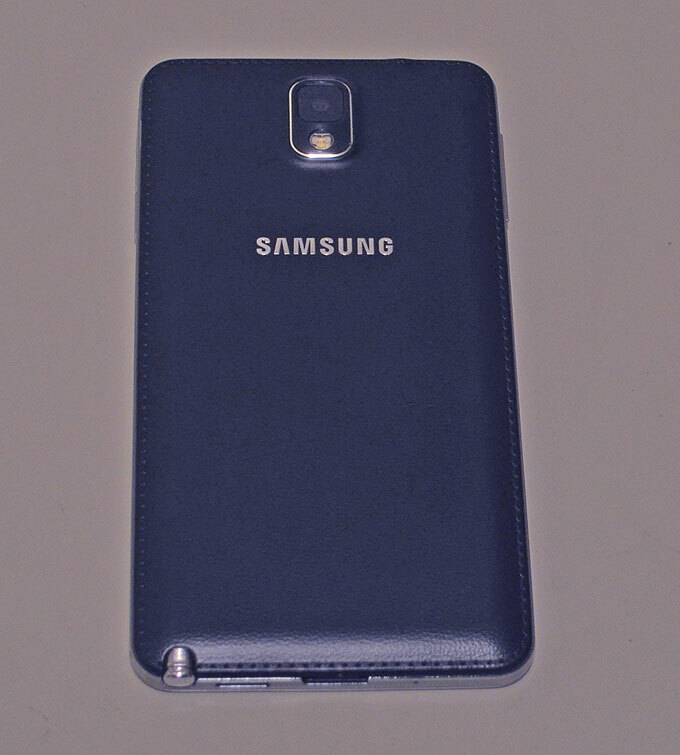 Samsung Note 3 fake leather back! I will warn you about data usage. In less than I day I burned through 500mb of data. Yes, half a gig in one day! We will keep an eye on this as perhaps many updates and downloads were going on as expected - but half a gig in one day! What else - of course - will it fit in your pocket. Short answer is yes without reservation it will slide in there with room to spare. You can sit down with it and it will not poke your privates. You can slip it in and remove it still seated in a car. The pocket ability is the thing everyone tries when they find out I have one. That pocket ability is the make or break item about buying this thing. Can it be carried around in a pocket, and this was the big relief and most pleasant surprise. That fact that I handle it just like an iPhone 4, it goes in the pocket. The thing is slim even with the gel case on it and is hardly noticeable in your 505 jeans. Battery: Seems to be about two days which is magnificent! Better than iPhone on iOS 7. Battery is a big deal in the productivity game, and you can replace this one with a fresh battery if need be. Transferring contacts: I was an iPhone user and transferring contacts from the iPhone to Android was a pain. Just go into iTunes and export to windows. Then convert into csv file and upload to a gmail account and presto the contacts are in your phone. But not all the information carries over, any of the phone numbers are missing. None of the photos went through either. So you still have to build back the list a bit. Transferring Music and other media: This requires you downloading a Samsung program, one version for all their other phones and one for Android 4.3 of which only the Note 3 has at the present time. That program is still in Beta form (still in testing) and it did not work on XP. But I tried it in Win 7 and it worked but still complained that it was not properly installed. But it does work on Windows 7. Sounds and notifications: You will turn off all those cute little sounds. I swear they have this happy little whistle signifying something but it is just too cute to keep on a serious phone. I would replace them with more conventional sounds. Speaking of which, why oh why do I have to download a program just to get a clasic ring tone on the phone. For a phone that is the darling of businessmen everywhee this is unforgivable. They have a selection of laughable ringtones but not the usual standby. I swear if you move in the corporate environment you will hear the classic ring tone on Blackberry and iPhone and it is the same ring making everyone wonder if it is them. You want that instead of a dog barking or some hit man telling you to "pick up the f**king phone!" Anyway with an app I now have the classic ring on the thing. Other quirky items: Videos don't just show a screen shot in their folders but clips of the videos, very cool! You can't save photos from Facebook, but Flipboad in the Samsung apps can. You also have to jump through hoops to get push email from non-gmail accounts. Not very business like! App Store: Google Play has all kinds of apps that are free, but the really powerful apps that I got on the iPhone are missing. Of course I had to pay but the apps were mostly solid business apps. The nod here goes to Apple. Actually - being honest here - the selection of android apps are kind of disappointing at first glance. But that could change. But right off the bat Facebook and Instaclip have more apps and functionality on the iPhone platform. Some obvious ones is saving photos on Facebook and instaclip for instagram to save photos. Note again that Apple excels at the social media apps and their integration (I guess the geeks don't get out much so android users don't care so much). Want a solid example. well it is in the FTP client. On the iPhone I can FTP pages and edit them all in the same program. For Android I have to download the file on one program and edit on another. On Android it is all free but the convenience makes Apple the better one in the end. And so it goes like that, more polished apps on Apple but you pay for it. Verdict: Better than the iPhone in most ways. Yes the form factor is different but the ability of this phone is unique, a sort of ground breaking phone the Notes have become. The Note 3 is a tower of power, and the screen and stylus are like magic in your hands! However, I will admit that the iPhone has a prettier more artful experience. The phone is better built of better materials and the home screen, lock screen and the way things work is a pleasure to behold. The Samsung is more matter of fact, get the job done and that is it, and actually that fits in with its productivity profile. The fact that iPhones come vertually preinstalled with Facebook and many social media pre-installed lends its appeal to the social crowd and women in particular. On the Note you have to look around and add the things and they still don't work as well as the iPhone. Life is so much more visual and tactile with the iPhone. I don't love touching the Note 3 like my IPhone 4 with its forged stainless steel and glass - literally an industrial work of art. No, the Note 3 is no industrial work of art, not even close. So the phones are different. Does the average iPhone user care about 4K or gigs of DDR Ram, no they don't. They want a phone that just works and keeps them connected. And that has its appeal. But as a smart phone, the Note 3 is the current king! Plus with the gear watch you have a combo that also - again - does not exist anywhere else. A phone and watch communicating and working together. I have checked the webb for problems and only licencing on one app and area restrictions of some unlocked phones. One guy was showing a loose button on his phone that was neverthelss functional. Very impressive, no os glitches like iOS7 and no major hardware embarassments. They are really trying to be number one. Samsung smells blood and is going in for the kill on Apple.